Travel Destinations | Life Is A Festival! In August I spent a couple of days pet sitting in Oxford. I’d always liked the city and it was a great way of becoming a temporary local while spending time with a cute dog. 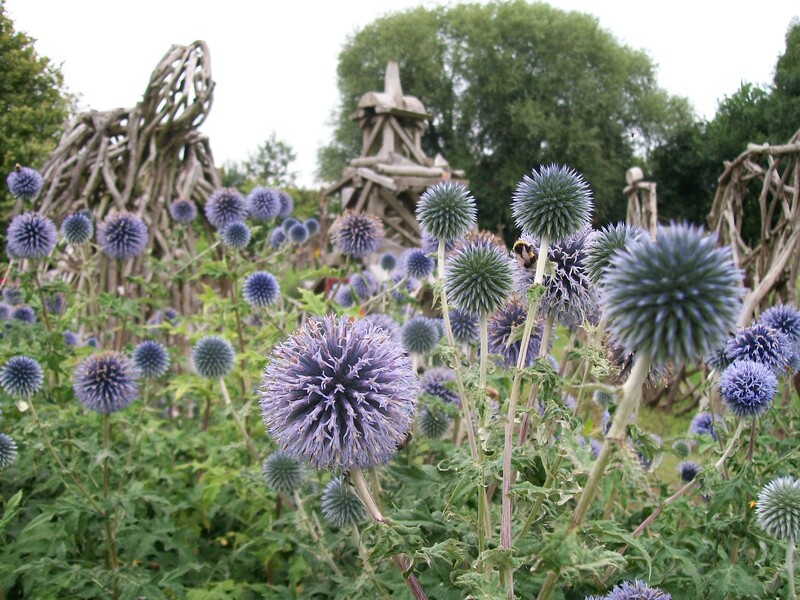 So here is a roundup of my favourite things to do in the ‘city of dreaming spires’ that include some more well-known attractions as well as off the beaten path suggestions. Amazing anthropology museum which is attached to the natural history museum and offers free tours every Wednesday and a couple of other times a month. You could easily spend a whole afternoon here, but can also get a good overview in less than an hour. Free entry and staff are knowledgeable and friendly. The major punting hub in Oxford is right by the Madgalen bridge in the centre. If you feel like a quieter experience (depending on the season and weather) with less of a chance of other inexperienced hobby punters bumping into you while giving this fun activity a go, try the Cherwell Boathouse in North Oxford, about a 20 minute walk from the station or a short ride on a local bus up Banbury Road. There is also a restaurant/cafe attached to the boathouse, which makes for lovely riverside dining or a celebratory pint after you’ve successfully mastered your first punting lesson. This is one of my favourite areas in the city. Walton Street boasts a long list of fabulous pubs, cafes and shops to keep you busy for an afternoon or evening out. Favourites are the Jericho Tavern (regular live gigs upstairs,) and the Albion Beatnik bookshop and cafe, a cosy independent bookshop, where I attended a fantastic poetry night. 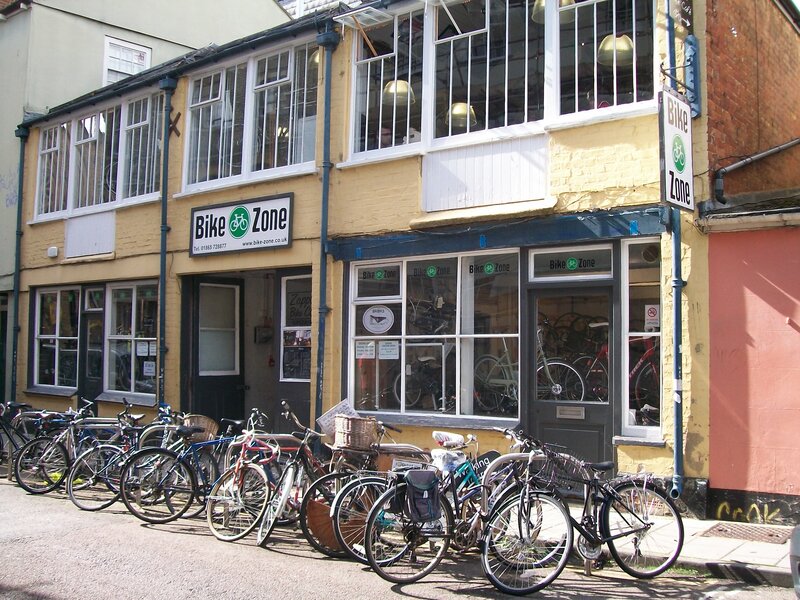 Another cafe I really liked for it’s excellent coffee and relaxed atmosphere is Zappi’s Bike Cafe, above a bike shop on St Michael’s Street, a short walk from Jericho in the centre of Oxford. On Sunday I visited the local Unitarian church in a beautiful historic building and got talking to a lovely woman, who took me along to one of the National Garden Scheme’s Open Gardens for Charity. We had tea and scones on the lawn with her friends and I got invited to another event, a private folk dance evening in someone’s garden, the following night. 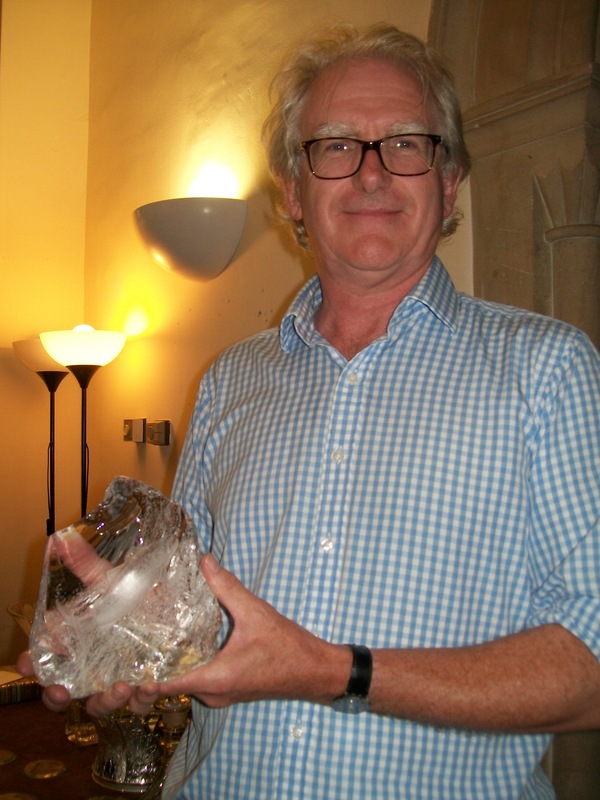 I also attended a fascinating talk by well-known glass engraver (to the Queen, no less) Philip Lawson Johnston. 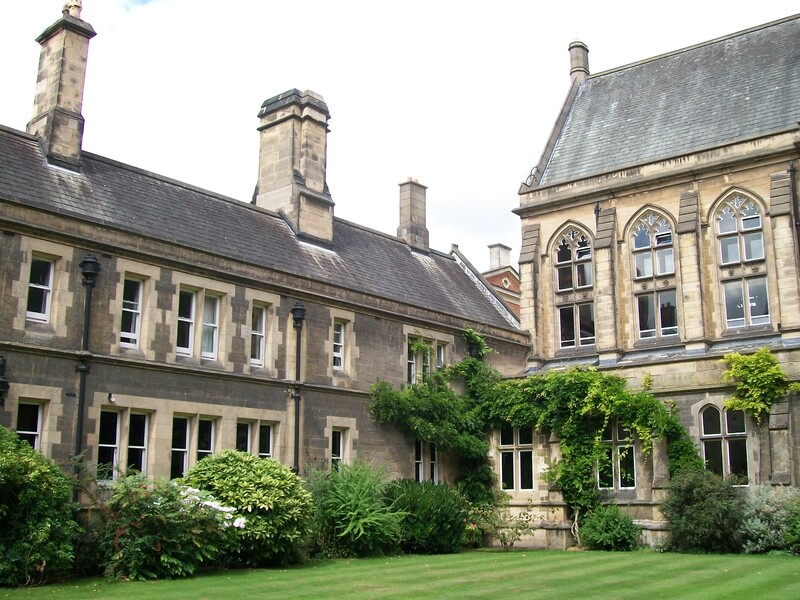 A great way of combining seeing one of the colleges for free with a lovely musical experience is to attend an evensong session in one of the famous university churches. We went to Christchurch on a beautiful summer evening and after enjoying an hour of music in the cathedral got some great sunset shots of the buildings and courtyard. It’s free, but do turn up early as seats tend to fill up quickly. I was excited to see that apart from a few larger music venues, such as the O2 Academy, Oxford also boasts quite a few lively music sessions in various parts of the city centre and beyond. While I was there I visited the James Street Tavern off Cowley Road for their Tuesday night session, which was lively and fun, and the Halfmoon Irish pub on a Thursday night. This area also has a couple of other venues with live music, e.g. The Bullingdon, the Cape of Good Hope and Cafe Tarifa. 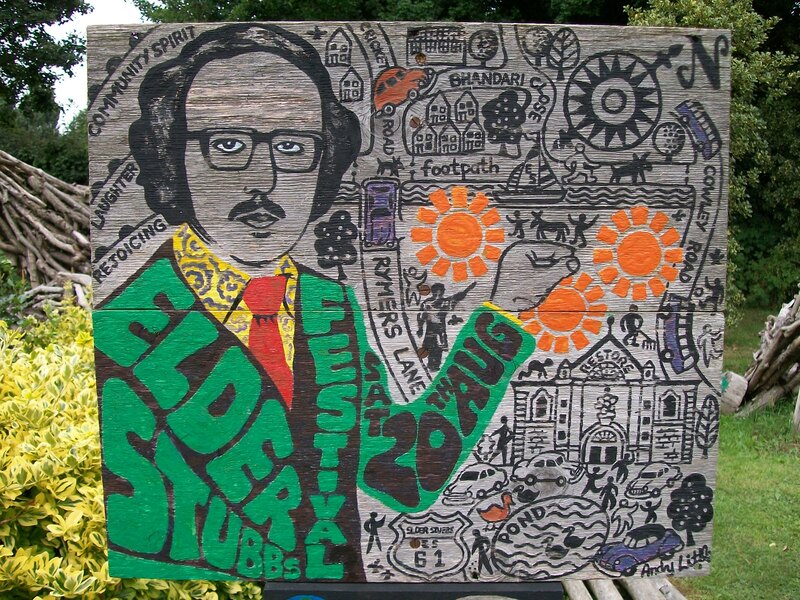 Also watch out for the fantastic Folk Weekend Oxford in April and the Elder Stubbs allotment festival in August (both accept volunteers). On my one rainy day during my stay I did a bit of internet research after breakfast and found out that Headington seems to be the place to be for a good charity shop browse. 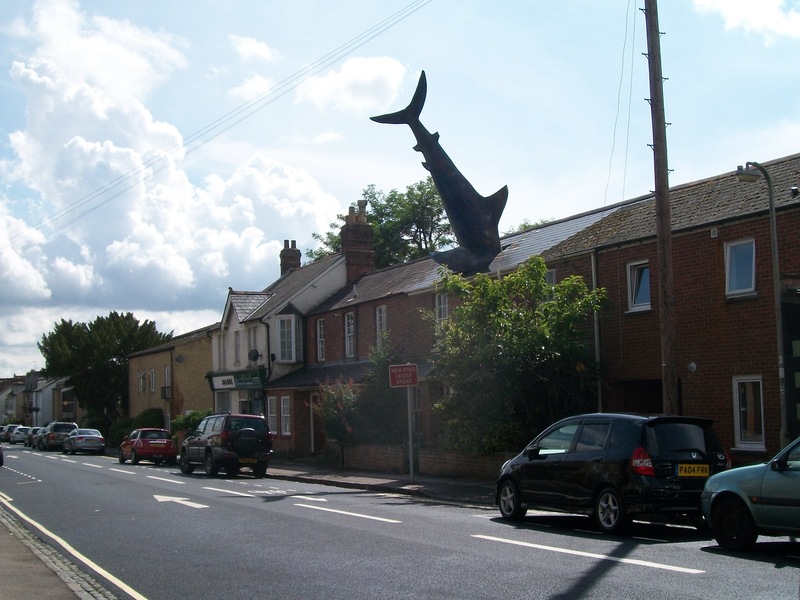 It not only has a cluster of half a dozen shops in close vicinity (see list here), but also offers a very unique visitor attraction: the Headington Shark. With Oxford being such a vibrant university city, events abound and the best way to find out what’s going on at any one time is to check out Daily Info (which also lists arts, theatre, workshops and family events), Nightshift (also available in paper form in many pubs and bars around town), Music in Oxford, Folk in Oxford, Young Women’s Music Project, Evenbrite or Meetup. P.S. 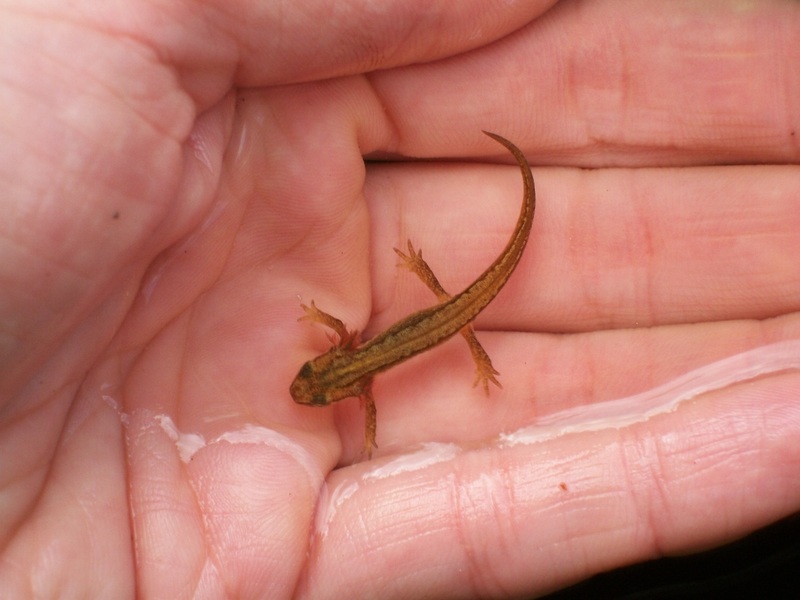 My very favourite thing of my time spent in Oxford was coming across baby newts in the garden pond of the house I was staying in. They are fascinating animals who live part of the year in the water and part of the year on land and seeing them upclose was quite a special treat. When a good friend of mine mentioned last November that she was going to fly to Bucharest for a few days after Christmas I wasn’t all that excited at first. But a pretty cheap flight, a cosy apartment in the centre and Bucharest’s label as ‘Paris of the East’ proved just too tempting in the end. The deal was my friend was going to mainly concentrate on ‘church seeing’ while I was going to delve into Bucharest’s cultural scene, if there was any to speak of. So far, so good. Spending a few days in a place you have absolutely no expectations of can be a great advantage. As the list of things I absolutely wanted to see was relatively small, I ended up spending whole days with my friend wandering through different parts of the city. We watched iceskaters doing their rounds in Cismigiu park, cuddled with some cats in the village museum (with buildings from different regions in Romania) in Herastrau Park and visited more churches than I had ever seen in one place before. To my own surprise I became quite fascinated with walking past walls and walls of iconic images in the semi-darkness and watching young and old light candles for the living and the dead (or in some places the ‘sleeping’). 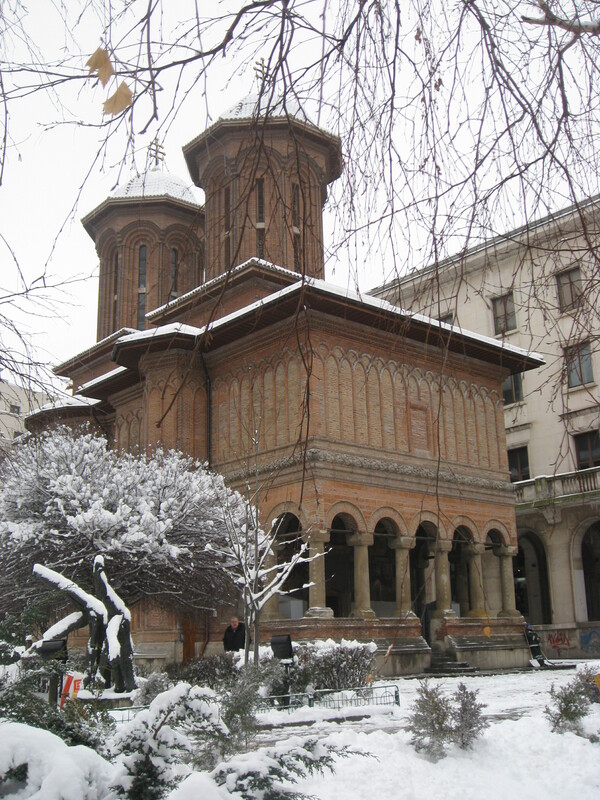 Each church had a different feel to it, my favourites being the Cretulescu Church and the Stavropoleos Church. I was quite touched by how religious Romanians are, even some of the city dwellers, and how they seemed to draw a lot of strength from it. The day after we arrived it started snowing quite heavily and the rest of the week was dry, so all the roofs of the buildings and the tops of the trees were covered in a magical, white layer like powdered sugar. The snow somehow helped to soften the edges of a city that, particularly in the old town, looked in parts like a set for a WWII movie while every other building was a (theoretically) depressing-looking Communist era apartment block. But instead of being disappointed I found myself more and more drawn to this city with its mix-and-match look and its wealth of Orthodox churches with old ladies, clad all in black, selling candles at the door. Churches aside, of course I also discovered (or excavated?) 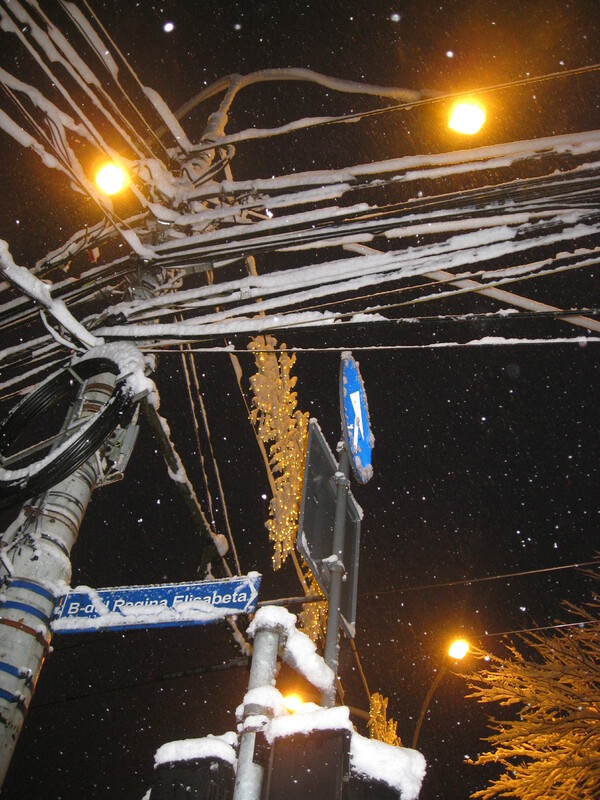 the cultural side of Bucuresti (the Romanian spelling of the city’s name). As the language barrier was a bit of a hindrance for movies and theatre shows, we spent a lot of time warming up in cafes and bookshops. Our favourite haunt, and our usual place for meeting some of the local couchsurfers, was the café in the basement of the huge Carturesti bookstore near Piata Romana, a real haven for bookworms like myself. Another great café for coffee and chocolate fans was Chocolat in the old town, where they also served excellent savoury dishes. I also enjoyed browsing in the smallish Anthony Frost English bookshop and went to a concert by Ada Mileia (who sings in Romanian and English) in the Art Jazz Club, a mere one minute walk from our apartment. I can also recommend Green Hours jazz club for gigs and other arts events. Despite the many social and economic issues the majority of Romanians are still facing, we were both surprised at how much we had fallen in love with Bucharest’s rough charme in those couple of days. 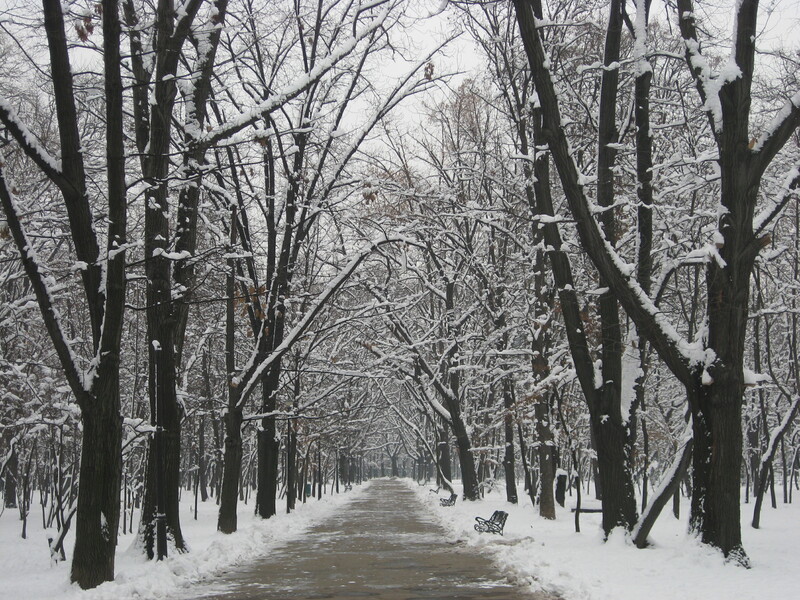 So if a friend of yours suggests to fly to Bucharest for the Christmas holidays, just go along, talk to the locals, walk the city’s streets with open eyes and you might be in for a nice surprise. I certainly was. There are a million reasons for returning to Paris again and again. It’s one of those places that is constantly evolving and I never tire of it. My recent trip in August happened to be in the middle of the main tourist season (mon dieu!). But having already visited the main attractions the first couple of times, this weekend was exclusively dedicated to soaking up the atmosphere. First things first and that usually means getting a guidebook. I absolutely hate dragging around heavy tomes or traffic-stopping maps the size of a small parachute. That’s why I’ve fallen in love with the Cartoville Mapguides. For about 8 euros a pop, they fit into your handbag, feature useful fold-out maps of different areas, handy sightseeing, food and drink tips and are available as Everyman Mapguides in the UK and Knopf Mapguides in the US. Et voila! I’ve been a fan of the French Open since I started learning to play tennis as a child and loved watching my favourite players battling it out on the red sand of Roland Garros every year on telly. But nothing compares to actually standing on the centre court (seating capacity of 15000), seeing the players’ changing rooms and hearing some behind the scenes stories (never knew that they get a hefty fine if they don’t turn up for interviews after their matches). Roland Garros offers tours in French or English, there is an excellent tennis museum and a souvenir shop too. The metro stop is Porte D’Auteuil. I’m always on the lookout for the best coffee in town and am especially thrilled if it comes nicely presented with some sweets and a glass of water AND a view of Notre Dame but without a group of noisy tourists at the next table. Such a gem is La Cafeotheque (metro: Pont Marie). Superfriendly and knowledgeable staff, coffee being roasted on site, a choice of mouthwatering speciality coffees and a cosy atmosphere with mainly local customers. If you’ve been on your feet all day exploring the beautiful streets and parks of Paris, step into La Cafeotheque, lean back and enjoy! La Duree (e.g. Rue Bonaparte, metro: Saint-Germain-des-Prés) is not your ordinary bakery. It is one of the poshest addresses for macarons (not macaroons, see wikipedia for the difference) and other little treats which tend to go down very well as pressies for loved ones back home. If you feel like treating yourself a bit (or big time), this is the place to go. If speciality teas are more your thing, check out Mariage Freres, a tea connoisseur’s heaven in the Marais area (metro: Madeleine). While you’re in Rue Bonaparte drop into Aesop for beautiful natural cosmetics from this Australian brand. I first got hooked on them (ah I love my legal drugs) while travelling in OZ and Cate Blanchett also seems to be huge a fan. So now I treat myself to a few pots of of their special potions whenever I get into one of the few shops in Europe. They do mailorder also, but it’s so much more fun to get the products in person. Rue Bonaparte is also one of my most cherished places in Paris as this is where one of my favourite designers, Eileen Gray used to live most of her life. Her E1027 table is simply the best piece of furniture I’ve ever owned. In fact, if you could hug a glass table I would. After so much serious pampering it’s time to lighten up a bit and what better way to do that than to jump on one of the many Paris carousels. You may get some funny looks from the 5-year-olds sharing the wooden horses with you (and a cow, what was that all about? ), but don’t let that put you off. Give the little ones a cheerful high five and you’re good to go. You can find these marvels of the past at the bottom of the hill of Sacre Coeur on Montmartre (remember Amelie?? ), in the Jardin des Tuileries, in the Luxembourg Gardens and also in the Parc du Champ de Mars. I’ve been very much into artwork by illustrators recently (found another fabulous one in Edinburgh, more later) and came across this artist’s work in the bookshop of the Centre Pompidou. Rebecca Dautremer illustrates mainly young people’s books, the one I took a look at was called ‘Les Princesses’. Here is an interview with her in English to get an idea of how she works. Aren’t the drawings just magical? Both dark and dainty at the same time. Marveilleux if you ask me. Mais non, if you’re still looking for more things to do on a summer’s day in Paris go to one of the free readings at Shakespeare & Co, a quirky bookshop that stocks English-speaking books. Also check out Paris Plages (sand, deckchairs and icecream sellers along the Seine) and the FNAC music festival (free gigs outside the Hotel de Ville including acts like Malians Amadou et Mariam). En fin, after all the excitement of the day head to the Canal St Martin area for a few drinks in one of the many bars and cafes. Since moving abroad I’ve been having a great time being a tourist in my own hometown every few months or so. I couldn’t have picked a better time for a visit this summer as the weather was just perfect for balmy nights in the beergarden, there was a free outdoor jazz gig, I got to play with my cute nieces and discovered a few new corners of the place I grew up in. Ah it’s so nice to be able to leave your umbrella at home (if at all, it might come in handy to shield you from too much sun) and spend every night beergarden hopping, fanning yourself with the cocktail menu while contemplating the next drinking destination. In Augsburg alone there are about 100 beergardens to choose from, there is even a little guidebook for that serious (= Irish style) beergarden crawl! Let’s face it, you’re only in town every couple of months, so there should be dinner invitations left, right and centre. I never fail to have Kaesespaetzle at least once when I’m home and never turn down an invitation for afternoon tea, especially when the host mentions homebaked cake…mmmhhh…in fact I more than once managed to have four brunch/coffee/dinner/coffee get togethers all in one long, leisurely vacation day. Bliss. No introductions or explanations needed, no awkward moments, just sipping coffee together, giggling about jokes that only you find funny and having a brilliant time. You know how much the tram ticket is and where to catch a bus to your favourite cafe. You don’t need to do any sightseeing because you know the place inside and out. Plenty of time to just relax, eat, drink and laugh. Well, this might not apply if you’re living in any other place than Dublin, but it is just incredible how much cheaper everything always seems back home. Being a firm believer in appreciating the little pleasures in life, I always happily eat and drink my way through the menu of all my favourite foodie places and smile at the thought of how in Dublin this would have cost me a small fortune. By the way, buffet style brunch (usually includes a hot drink and/or juice and a selection of savoury and sweet food all for under a tenner) is amazing in Germany and you can sit there all morning with your friends. When your friends are at work but you have a bit of time on your hands, take an extended walk around town and you’ll be surprised at what you’ll find. Turn into a street you normally wouldn’t take, peak around an unfamiliar corner, get off a tram stop earlier, have a chat with a stranger at a newsagent’s, sit on the steps of a little church watching everyday life go by. When it’s almost time to go back pick up a few tourist office brochures to show to your friends and colleagues abroad. Every place tends to have a few interesting things it is known for, be it the best local brewery, the most famous writer or artist or some curious historical facts – go dig them up! I always miss my favourite chocolate, speciality teas and my mum’s christmas cookies, so on the way back to Dublin I generally fill up my suitcase with as many of them as I can fit in. I tell ya, having such a stash with things from home is priceless when you’re hit by a bout of homesickness on one of those dark, rainy November days. The ‘Fuggerei’ is the world’s oldest social housing estate dating to 1516. Famous Augsburgers include Leopold Mozart, Bertholt Brecht and Rudolf Diesel.